Canning is an economical way to preserve fresh quality foods at home while retaining their important vitamins and nutrients. 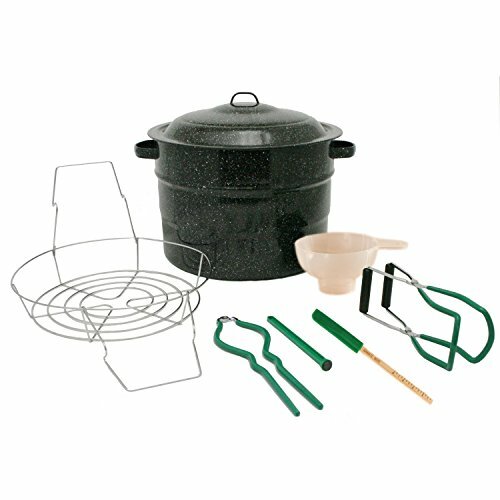 The Granite Ware 8-piece Canning Set includes everything you need to get started! The kit includes a 21.5-quart Water Bath Canner that holds seven 1-quart jars. The Jar Rack makes lifting jars out easy and is collapsible to save space. The 5-piece tool set includes a bubble remover, jar lifter, magnetic lid lifter, jar wrench and jar funnel. Durable enamel-on-steel construction heats quickly and efficiently. Side loop handles help ensure safe, secure transport. The domed lid helps trap in heat for faster boiling. Safe to use on gas and electric stovetops. Not recommended for use on glass cooktops. Hand wash.